I hope your weekend is going well, mine certainly is! Although I need to actually get some school work done today… Yesterday I was reading for Sports Law & Society (yes, that’s a class) and I’m thinking how easy this class would be… Well the whole 40-something pages we have to read are about antitrust law and it went way over my head… So I got frustrated and quit. Noooot the best way to start my weekend studying. But today is all about getting my First Amendment reading done since I know I’m getting called on in class tomorrow. 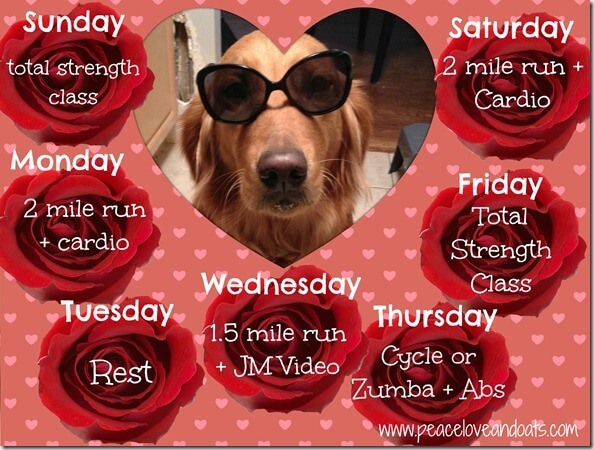 IT’S TIME FOR WEEKLY WORKOUT ROUNDUP!!!! Do you like how I tried to make that sound exciting? Wednesday – 1.75 mile run + Jillian Michaels Video (or strength at gym) waited to workout until after class… never happened. Learned my lesson. What’s your favorite kind of workout class? I’m Going to Boot Camp!